Really Useful 70 Litre Box Clear 70C Pack of 1 External dimensions: L810 x W620 x D225mm. Internal dimensions: L710 x W545 x D190mm. Made from high impact polypropylene. Ideal for under bed storage of bedding or linen. Completely transparent box for easy viewing of contents. Rotadex Platfile Modular Circular Platform RP24MODPLAT Pack of 1 Additional platform for Rotadex Modular Platfile. 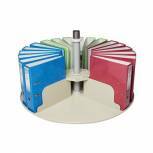 Holds 24 A4 or foolscap lever arch files. 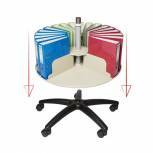 When connected to base (sold separately), the platform rotates independently with a retaining safety lip and an internal support plate to keep files upright. Rotadex Platfile Modular 5 Star Base RP24MODBACA Pack of 1 Castor base for Rotadex Platfile system. Made from sturdy black plastic. Part of an interchangeable, modular system. Five castors for smooth mobility. Base only: requires Platfile platforms (sold separately) for use. 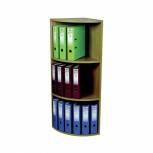 Rotadex Corner Unit 3 Tier Light Oak CU20 Pack of 1 Three tier corner unit ideal for storing lever arch files in unoccupied corner spaces. Supplied flat packed but easy to assemble with a capacity of 18 lever arch files. Light Oak. 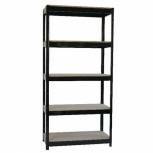 Zamba Medium Duty Boltless Shelving Unit 5 Shelves STS56221 Pack of 1 Medium Duty Boltless Frame Shelving with 5 height adjustable particle board shelves. Steel framed shelving with simple boltless construction. Each shelf accepts 80kg in weight. Dimensions - W850 x D350 x H1660mm. Non-returnable. Jemini Open Storage Shelf Box C White KF74160 Pack of 1 Pack of 3 shelves . Designed for 1800mm high cupboards and bookcases. Finish: white..
Jemini 730mm Open Storage Box A White KF74151 Pack of 1 Box A for an Open Front Storage Unit. Designed to fit A4 and foolscap files. Contains the back, sides and shelf. Supplied flat-packed for convenience. Other boxes are required for complete product. Height: 730mm. Finish: white. Jemini 1800mm Open Storage Box A White KF74152 Pack of 1 Box A for an Open Front Storage Unit. Designed to fit A4 and foolscap files. Contains the back, sides and shelf. Supplied flat-packed for convenience. Other boxes are required for complete product. Height: 1800mm. Finish: white. Jemini Open Storage Box B White KF74159 Pack of 1 Box A for an Open Front Storage Unit. Designed to fit A4 and foolscap files. Contains the top, bottom and all fixings. Supplied flat-packed for convenience. Other boxes are required for complete product. Finish: white. 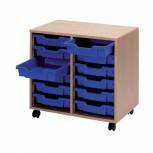 Jemini Mobile Storage Unit 6 Tray Beech KF72338 Pack of 1 Jemini Mobile Storage Unit. Hardwearing unit manufactured from 18mm beech carcass with solid backs for extra strength and integral castors for ease of use. Supplied complete with 6 Blue Trays. W370xD495xH650mm. Non returnable. 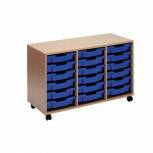 Jemini Mobile Storage Unit 12 Tray Beech KF72339 Pack of 1 Jemini Mobile Storage Unit. Hardwearing unit manufactured from 18mm beech carcass with solid backs for extra strength and integral castors for ease of use. Supplied complete with 12 Blue Trays. W710xD495xH650mm. Non returnable. 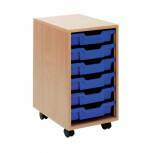 Jemini Mobile Storage Unit 18 Tray Beech KF72340 Pack of 1 Jemini Mobile Storage Unit. Hardwearing unit manufactured from 18mm beech carcass with solid backs for extra strength and integral castors for ease of use. Supplied complete with 18 Blue Trays. W1030xD495xH650mm. Non returnable.